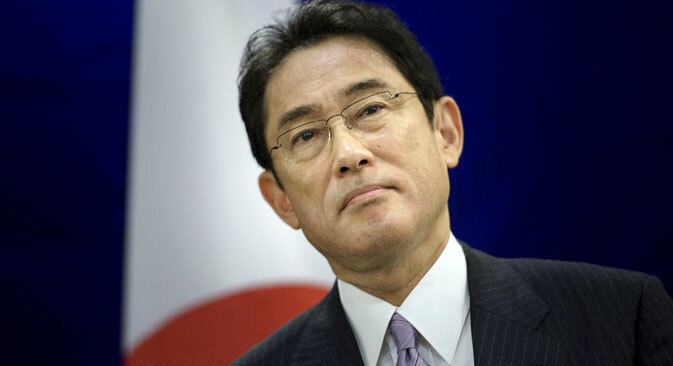 Japanese Foreign Minister Fumio Kishida. Moscow and Tokyo are finalizing the agenda for Putin’s Japan visit. Japanese Foreign Minister Fumio Kishida will call on Russian President Vladimir Putin in St. Petersburg on Dec. 2, the Kremlin press service said in a statement on Dec. 1. “Putin will receive Japanese Foreign Minister Fumio Kishida, who will be on a working visit in Russia for talks with [Russian Foreign Minister Sergei] Lavrov,” the press service said. The Japanese top diplomat’s visit will “summarize a series of bilateral contacts in political, economic, humanitarian and other spheres in 2016 and will become the final stage of preparations for the Russian president’s official visit to Japan,” the statement reads. Putin’s visit is scheduled for December 15-16. Putin spoke of ties with Japan during his annual address to the Federal Assembly on Dec. 1, saying that Russia expects them to progress. He also welcomed Tokyo’s determination to develop economic ties with Russia and launch joint programs. Russian presidential spokesman Dmitry Peskov told TASS earlier that the possibility of signing a peace treaty with Japan is currently being discussed at the level of experts. Russia and Japan have been paying special attention to economic ties over the course of 2016. In early November, Japan’s Minister of Economy, Trade and Industry Hiroshige Seko, who is in charge of economic relations with Russia, paid a visit to Moscow. During his stay in the Russian capital, he said the two countries had chosen about 30 priority projects for cooperation to be materialized by mid-December. Russia and Japan have still not signed a World War II peace treaty. The countries have failed to resolve a decades-long dispute over the Southern Kuril Islands- Shikotan, Habomai, Iturup and Kunashir, which are administered by Russia, but claimed by Japan.